I want to extend my deepest and most sincere thank you’s to those of you who have reached out to me over the past week. I’m doing better, every day is a little better than the last. I know I will always miss my mom, but I also find comfort that she is no longer in pain and is in a much better place. I’m also gradually feeling better about the other situations going on around me. Between keeping myself busy with day to day stuff (full time job, tutoring, kung fu, running, etc) and other fun events, I have been able to push the majority of the stress and worry to the back of my mind. Through family members who have reached out to me and shown their support and that they understand and agree with how I’m feeling along with therapy, I’m able to work through what I’m feeling and why. It’s helping me to draw a line between what I can change and what I can’t change. I can’t change what other people do, say, or think. I can only change what I do, say, or think. I am trying to do positive, say positive, and think positive. Anything else is being thrown away. I find myself praying and thinking of God much more often. It comforts me and helps me re-focus on what’s truly important. For those of you who know what’s going on and are helping me get my message across, thank you. For those of you who don’t know what’s going on, please keep me and my family in your prayers. We are all going through a hard time with the loss of my mom and with other situations occurring recently. I see a light at the end of this tunnel that we’re in currently. And I have high hopes that everything will work out the way they’re supposed to. I know God will look over me and my family and He will be there no matter what happens. I’m going to take this summer and use it to focus on what’s important to me and my family. Vince is my family, he is most important to me along with my brother and father. We will get through this. 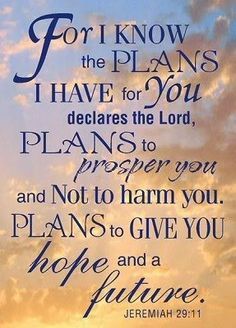 God has a plan. Next posts from me will legitimately be better and better.